Women’s reproductive cancers—such as ovarian cancer, endometrial cancer, uterine cancer, and cervical cancer—are especially difficult to treat. Mortality rates are high (32,000 women die from these cancers each year in the U.S.); funding is low (taking into account incidence and mortality, ovarian cancer receives nearly 20 times less funding than prostate cancer); and current therapies often cannot combat the frequent relapse and resistance. 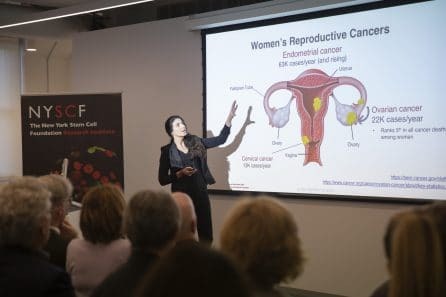 NYSCF is now taking on these challenges with its new Women’s Reproductive Cancers Initiative, launched last week with a panel discussion focused on improving outcomes for these patients. Dr. Laura Andres-Martin explains the different types of women’s reproductive cancers. 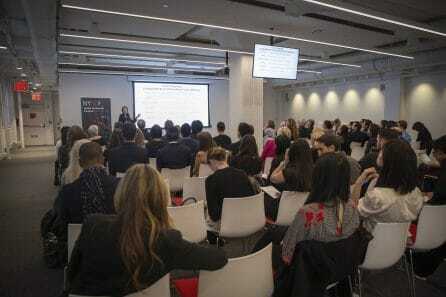 At this event, leading cancer physicians and researchers discussed what needs to change to bring more effective, personalized treatments to women with reproductive cancers. 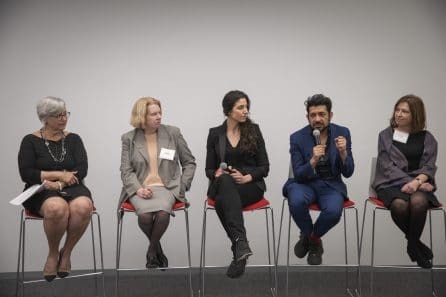 The discussion was moderated by NYSCF CEO Susan L. Solomon, JD, and featured Dr. Andres-Martin, Carla Grandori, MD, PhD (CEO, SEngine Precision Medicine), Ursula Matulonis, MD (Chief of Gynecologic Oncology, Dana-Farber Cancer Institute), and Siddhartha Mukherjee, MD, DPhil (Assistant Professor of Medicine, Columbia Medical School). Applying fresh, innovative approaches to shift paradigms in the way women’s reproductive cancers are studied and treated is the mission of NYSCF’s Women’s Reproductive Cancers Initiative. The Initiative is guided by a Scientific Advisory Board of world-leading cancer researchers and physicians, including Drs. Grandori, Matulonis, and Mukherjee. The Initiative will bring the latest technologies and advances in stem cell research to bear on the unmet needs of women with reproductive cancers, starting with ovarian cancer, where the need is especially high. Dr. Laura Andres-Martin discusses the capabilities of organoids. Scientists typically study tumors by taking biopsies from patients, but these samples can only live outside the body for a short period of time, limiting the number of experiments researchers can use them for. The NYSCF initiative will use samples of patient tumors to generate stem cells and organoids (3D aggregates of tumor tissue that recapitulate how cells interact) that have an unlimited lifespan. With a biobank of patient-specific tumor tissue that never “expires,” scientists can continue to study its properties and responses to drugs with infinite experiments – providing a foundational resource for the wider research community. Cracking the code that dictates how cancers grow would open the door for early detection strategies, which ovarian cancer desperately needs. 70% of ovarian cancer cases are diagnosed at late stages, and these patients have a 5-year survival rate of just 29.2%. Dr. Grandori highlighted the importance of personalized models for capturing the unique qualities of each patient’s tumors and informing treatment strategies. Susan L. Solomon, Dr. Ursula Matulonis, Dr. Laura Andres-Martin, Dr. Siddhartha Mukherjee, and Dr. Carla Grandori participate in the panel discussion. Dr. Matulonis is a pioneer in the development of personalized ovarian cancer treatments. She played an integral role in bringing PARP inhibitors —the most successful targeted ovarian cancer drugs thus far – to patients. She is optimistic that the field will continue to evolve as we learn more about the mechanisms of ovarian cancer and that the methods used by the NYSCF Initiative will make targeted treatments even more effective. Ms. Solomon is also confident in the power of stem cells to improve outcomes for women suffering from devastating cancers. Watch highlights of the panel discussion below.